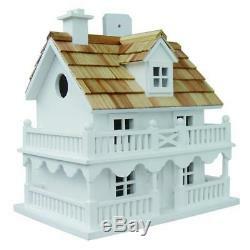 Home Bazaar Hand-made Novelty Cottage Bird House - Friendly Decor. Product Dimensions: 7.2 x 10.8 x 10.2 inches. Item Weight: 2.5 pounds. FINELY HANDCRAFTED & BIRD FRIENDLY - Our bird houses are built using only the finest materials available with a painstaking attention to detail that can been seen throughout the construction of each bird house. Exterior grade plywood & cedar or pine shingles helps ensure this wooden bird house will keep the birds comfortable and safe in any climate and in any region. EASY TO INSTALL, AND CLEAN - Start enjoying your bird house immediately. No building or frustration required on all small bird houses or large bird houses. We have designed our bird houses to be functional for the birds and the owners. An easy access to a cleanout makes it easy to clean and keep your wild bird house looking great all year. DESIGNED TO MAKE BIRDS HAPPY - Our decorative bird houses are fully functional and intended for outdoor use and is hand crafted. A 1.25 opening, ventilation, drainage, an unpainted interior. The shingles protect the house from the elements, giving the birds and the nest a comfortable home. We do not use any pressure treated wood or apply any harmful chemicals and use an outdoor, non-toxic, water based paint. SUPERIOR QUALITY - You can see our hand crafted attention to detail and quality craftsmanship through our entire bird house collection. Birds love our eco tough bird house as they are designed for small nesting birds, such as wrens, finches, chickadees, nuthatches and titmice, and other common nesting birds. Pine shingles top this classic avian residence now available in bright white. The fully, functional birdhouse features a removable back wall with a side entry hole to a single, unpainted nest box plus ventilation and drainage holes. A convenient paddle-board attached to the back allows you to hang this beautiful birdhouse anywhere. Item Dimensions: 10.25 H X 7.25" W X 10.75" D. We started to create the worlds most spectacular birdhouses and bird feeders. We have combined our love of birds, nature and technical and design ability to bring you the finest in avian housing. Handcrafted wooden bird houses made of kiln-dried hardwood and western red cedar or pine shingles for the roof. Non toxic, water based paint keeps the birds happy and the bird house looking great. Use this as a winter birdhouse, summer birdhouse, hanging birdhouse or put it on a pole. We know you will love it as much as we do. The item "Home Bazaar Hand-made Novelty Cottage Bird House Friendly Decor" is in sale since Sunday, August 19, 2018. This item is in the category "Home & Garden\Yard, Garden & Outdoor Living\Bird & Wildlife Accessories\Birdhouses". The seller is "tigerspecials" and is located in US. This item can be shipped to United States, Canada, United Kingdom, Denmark, Romania, Slovakia, Bulgaria, Czech republic, Finland, Hungary, Latvia, Lithuania, Malta, Estonia, Australia, Greece, Portugal, Cyprus, Slovenia, Japan, China, Sweden, South Korea, Indonesia, Taiwan, South africa, Thailand, Belgium, France, Hong Kong, Ireland, Netherlands, Poland, Spain, Italy, Germany, Austria, Israel, Mexico, New Zealand, Philippines, Singapore, Switzerland, Norway, Saudi arabia, Ukraine, United arab emirates, Qatar, Kuwait, Bahrain, Croatia, Malaysia, Brazil, Chile, Colombia, Costa rica, Dominican republic, Panama, Trinidad and tobago, Guatemala, El salvador, Honduras, Jamaica, Antigua and barbuda, Aruba, Belize, Dominica, Grenada, Saint kitts and nevis, Saint lucia, Montserrat, Turks and caicos islands, Barbados, Bangladesh, Bermuda, Brunei darussalam, Bolivia, Ecuador, Egypt, French guiana, Guernsey, Gibraltar, Guadeloupe, Iceland, Jersey, Jordan, Cambodia, Cayman islands, Liechtenstein, Sri lanka, Luxembourg, Monaco, Macao, Martinique, Maldives, Nicaragua, Oman, Peru, Pakistan, Paraguay, Reunion.